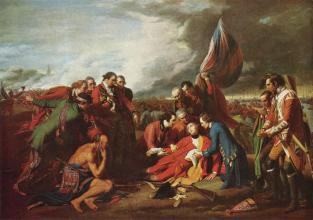 Benjamin West (October 10, 1738 – March 11, 1820) was an Anglo-American painter of historical scenes around and after the time of the American War of Independence. From 1746 to 1759, West worked in Pennsylvania, mostly painting portraits. 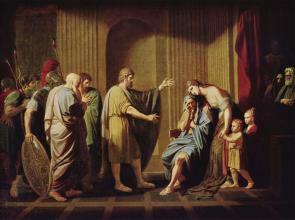 While in Lancaster, PA, in 1756, West's patron, a gunsmith named William Henry, encouraged him to design a "Death of Socrates" based on an engraving in Charles Rollin's Ancient History; the resulting composition, which significantly differs from West's source, has been called "the most ambitious and interesting painting produced in colonial America." Dr William Smith, then the provost of the College of Philadelphia, saw the painting in Henry's house and decided to patronize West, offering him education and, more important, connections with wealthy and politically-connected Pennsylvanians. 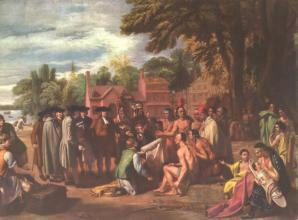 During this time West met John Wollaston, a famous painter who immigrated from London. West learned Wollaston's techniques for painting the shimmer of silk and satin, and also adopted some of "his mannerisms, the most prominent of which was to give all his subjects large almond-shaped eyes, which clients thought very chic"(Hughes, 71). 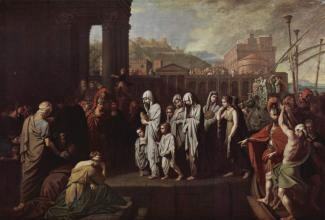 In 1760, sponsored by Smith and William Allen, reputed to be the wealthiest man in Philadelphia, West traveled to Italy where he expanded his repertoire by copying the works of Italian painters such as Titian and Raphael.